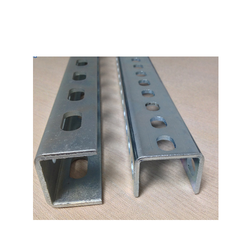 We are a leading Manufacturer of slotted channel from Mumbai, India. We are an eminent name engaged in offering a premium assortment of Slotted Channel to our clients. Additionally, the client can get the offered products from us at very moderate costs. ¿¿We offer Slotted channel up to length 12 meter in single piece.¿¿You can go through our website¿¿www.minifastindia.com¿¿for more reference. Looking for Slotted Angle Channel for Shelving ?